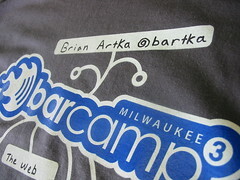 Note that I've had my friend Brian Artka add his name, Twitter handle and tags to his shirt, so I could demonstrate how the shirt will work at BarCampMilwaukee3. The idea is to create space in the design for each attendee to add a name, Twitter or Identi.ca handle and 5 tags to represent what they're interested in with a permanent marker. Each shirt becomes unique and personal, while also embedding key information to encourage strangers to say hello and start discussions. I'll be picking up a bunch of colorful permanent Sharpie markers next week, which I'l spread out on a table for BarCampMilwaukee3 attendees to customize. I can't wait to see how the concept works at the event! 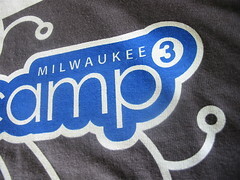 My favorite neighborhood screen print and embroidery shop, MJM Ventures, did a stellar job with my design once again. Thanks guys! Get a free shirt while they last! How? 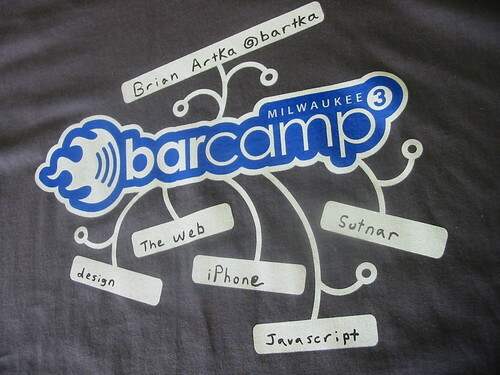 Sign up and attend BarCampMilwaukee3, October 4-5, 2008 at Bucketworks, 1340 North 6th Street, just north of Downtown Milwaukee (map). What a fantastic idea Mike. Very cool idea. I'm sure those will serve as great conversation starters.